According to a study conducted for IBM by Ponemon Institute, the average cost of a data breach has drastically increased. Ponemon conducted 1,500 interviews in over 383 victim organizations, for 16 different industries, within 12 countries. 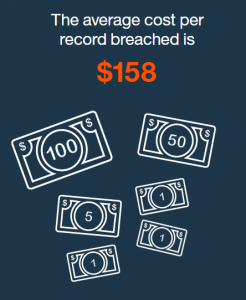 It was discovered that the average total cost of a breach is $4 million, which has increased by 29% since 2013. In Canada, that number has increased to $6 million, up 12.5% from 2014. This $4 million cost, breaks down to about $158 per record. However, this can range significantly depending on the industry. It’s also interesting to note that on average it took a company 5 months to detect a breach, and 2 months to contain the incident. With all of these numbers out there increasing on what seems like a daily basis, it’s still shocking to note that most companies do not properly invest in Information Security. According to the study, 59% of the total cost of a breach is due to responsive activities like forensics, legal fees, all communications and regulatory directives. The study also found that companies that had business continuity processes found breaches 2 months early and contained the breach 1 month faster.